But on this day, I just didn’t feel like playing the game. I tried to get myself motivated, to psyche myself up, and when three teenage boys approached the truck as we arrived, I heard myself saying that we didn’t need help and would do it ourselves. I walked purposefully away from them carrying the red Eagle Creek zip-up travel document folder that contained everything we usually needed at borders. “Migracion esta alla!” One of the guys yelled after me that immigration was the other way. I responded sharply with a how-dare-you-imply-I-don’t-know-what-I’m-doing glare and quipped “Si, pero los sanitarios estan aqui.” Yes, but the bathrooms are over here. When I got to the bathrooms, I took a sharp left behind the building and emerged by the windows on the other side. They were there waiting for me. Okay, you win, fellas. I just don’t have the energy today. How much is it going to cost me to have you solve the mystery of this border for me? I picked one of the kids, Claven, dressed in acid washed jeans with fancy pockets, a white shirt with one of those trendy prints that go around to both sides and a red baseball cap. We agreed on $15 for immigration and customs on both sides. I was immediately glad to be being dragged around from window to window without having to think. Immigration out of Costa Rica was smooth. I filled out our forms, and we were processed out of the country in no time. Cancellation of our vehicle permit was equally smooth although the agent refused to give the necessary form to Claven and insisted that I ask for it directly from her. No problem although it made me question just how welcome these guys were by the officials. A little too much but it felt worth it to me. We got some copies made, and Claven hopped on the running board, calling out directions to Ann in the driver’s seat. 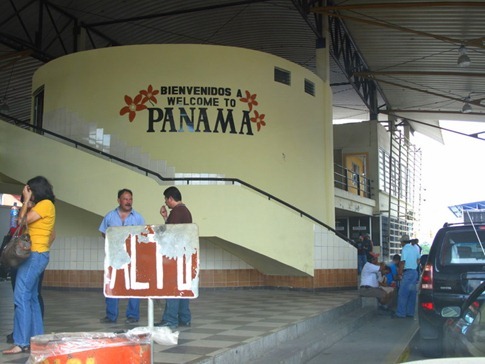 At the Panama side, we pulled along a yellow curb, and he put me in line at the immigration window. Meanwhile, he ran to go get the required insurance policy started and returned with a customs for me to fill out. Again, I thought, these “helpers” are pretty helpful. In the mood I was in, I’d probably be still be wandering around, trying to figure out the next step without him. He ran to the car to get Ann when the official at the immigration window asked for her. We both had to stand in front of web cams on the counter while he snapped a pic. He asked us about our professions and since we didn’t have a return plane ticket to show him, to present a credit card to prove we had the means to exit Panama at a later date. Panama felt like the most orderly and thorough border we’d been through yet. I looked back and forth at the two or three trucks parked under the overhangs and shrugged. This was nothing compared to the miles of trucks lined up or the overflowing parking lots of big rigs we’d seen entering Costa Rica. “Two hundred dollars,” he said, nodding confidently. It all flashed back to me, every blog I’d read that described being extorted at borders. Sometimes they felt they had you because of an error in some paperwork from the previous border, sometimes they made up rules having to do with bringing in a dog or something and sometimes, it was just to expedite the process. We’d read about these things turning into 8 hour horror stories and denied entrances, and usually, they ended with the gringos having to pay anyway. Maybe not the full amount, but at least something. Still, we’d been through seven countries so far and had only been asked for a $0.50 “propina” here and there. And in those cases, they really were “tips;” This was a bribe. He turned and started telling me about each of his friends. One apparently had just won $50 in the lottery but filled some paper out incorrectly and couldn’t collect his money. Another looked like the female lead in a Mexican sit-com. He even told me a story about the woman behind the computer having recently taken some time off to be with her family. Meanwhile, she was busily entering our information, making me confirm that our “Xterra” was not an “Xtrail.” I didn’t think she’d be working so hard before receiving her cut if she was still expecting one. Just then, the friend who looked like Mexican TV star came by and asked something in rapid Spanish. Claven smiled broadly and said, “No, no paga.” No, he’s not paying. She handed our vehicle permit across the counter and I braced myself. I couldn’t remember the exact amounts we’d had to pay at other borders, but it was always like $3 or $8, maybe $12 at the most. Anything over $50, and I was going to call the embassy and demand that they start the process of taking back the canal. She didn’t ask for anything. Claven walked me through a few more steps. We got a stamp on the vehicle permit and had an inspector take a look inside the car and sign the stamp, then brought everything to a hidden window where I paid $1 for fumigation. He turned and announced that we were done. We could – “shwip,” the sound usually made along with the right hand glancing the left on its way to gesturing towards a far off place – into Panama. From the driver’s seat of the truck parked along the curb, Ann could see Claven and me walking back towards her. She could see us shake hands and me pull out $15 and hand it to him. Then things got a little serious for a second but ended with big smiles and pats on the shoulder. During this entire process, I had opted to generally keep a smile on my face and try to exude a friendly confidence. In the end, I decided that Claven had performed his agreed upon task, one of which I was glad to have been relieved, and deserved his negotiated payment. But after handing it to him, I looked him in the eye and said, “Podriamos hablar en Ingles por un momento?” Could we talk in English for a minute? He nodded.